Image Size 16 x 20 x 3 in. Bruce Flowers was born in Woodstock, Ontario. 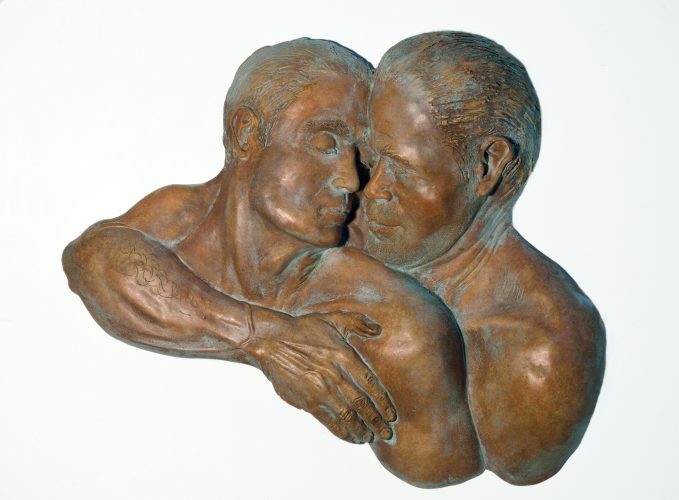 He was a member of the Sculptor’s Society of Canada and taught Visual Arts for thirty years. He graduated with an honours BA in Fine Arts from the University of Guelph in 1970. In 1982-84 he did his Master of Fine Arts (Sculpture) degree in New York at the Pratt Institute. Bruce is fondly remembered as the Founder of the London Pride Art Show, in 1992 and was presented the Ken Sadler Award, retiring as its curator in 2017 after many decades of involvement. He retired from Saunders Secondary in London in 2002 where he had been active as an openly gay teacher from the early 1990s. He considered his effort as a gay role model his most important contribution to education.